How much would you bid on a 30 year old sailboat? What if I told you it was donated to a charity that helps raise money to send needy kids to college? What if this 26' sailboat, with a 9.9 Evinrude outboard motor that runs fine, and that all the sails and rigging are in good condition? And what if you could get it for just a few hundred dollars? When I last checked, the bidding was up to $100 - so act fast! Bid on the boat now. Or, Happy Holidays if that makes you feel better. 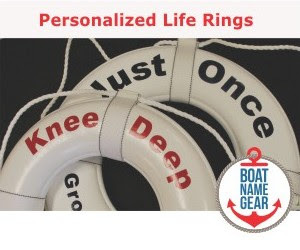 In any event, your holiday gift recipients will love a shirt, sweatshirt or hat that let's everyone know who is in charge of the boat. And at 15 to 30 bucks each, these items won't break your bank - so you can save your money for the holiday regatta. Check out all the gear here. Floating debris; other boats; large animals; icebergs; rocks; low tide; pirates. The list of things to worry about running into while you are boating are endless, but when you are sailing on the Great Lakes in the United States of America, bullets from machine guns should be one of them. Unfortunately, if the US Coast Guard moves forward with its plans to resume live-fire training exercises on the Great Lakes. Really, I may have never come across a hot young artist like Jamie Cullum without the wonders of Google and YouTube. Like last week's featured artist on Daily Boater, David Hasselhoff, this Cullum guy is HUGE in Europe. But the real question is, which performer do YOU think is more likely to have a hit music career in the United States? This weekend, visit the 29th Annual St. Petersburg Boat Show in Florida. It's happening at the Bayfront Yacht Basin in St. Petersburg, FL, now through November 19th (Sunday). For show hours, directions and more, visit this site. A couple of weeks ago we marked the end of the summer, and many people are now considering selling their boat in hopes of buying a new one next spring, or perhaps taking a year off from activity. We're always looking for interesting new or pre-owned boats to post on DailyBoater's Boat of the Week each Wednesday, and there's no reason next week's featured boat can't be yours. Simply list your boat for sale at FirstBoat.com, here, and it will be considered the following Wednesday for the DailyBoater Boat of the Week. Why else should you sell your boat at FirstBoat.com? Well, FirstBoat itself has some pretty great visitors. In fact, a survey we conducted a few months ago told us that 31% are planning on purchasing a boat within 6 months. You won't find that many boat buyers in your local newspaper, and on a big site like Yahoo your boat will get lost. Best of all, every boat listed for sale on FirstBoat is also sold on a network of other boating sites, including UsedBoats.com, MarineWeb.com and SunNews.com. Sell your boat here, now, and YOUR boat could be the next Boat of the Week! "Another grant was issued to the marina for a pump-out boat to transport waste from the floating restroom's two 750-gallon tanks into a sewer system." I thought for sure they would say the boat simply went out to sea and flushed. Here's some advice. Print this story out and read it in your own head... it makes it more interesting. This weekend, why not visit the North Coast International Boat Show and Fishing Classic? Visit the show's web for more info, mate. Now you can go on one of those dinner cruises every night in your very own paddlewheel dinner cruiser. Make an offer, and you can be hosting your own dinner cruise tonight! No new Daily Boater today, as we took the day off to go fishing. While we still can. It sure does this time of year, at least up here in New England. I found this song by Michael Leviton, and I think I like it as much as I like finding tunes and videos on YouTube. Check it out below, and if you like it, go buy it at iTunes or Amazon. The 45th Barcelona International Boat Show (Salón Náutico Internacional de Barcelona) kicks off this weekend, and expects to receive over 175,000 visitors to view yachts, boats and accessories for sailing, fishing, surfing and scuba diving. The show will occupy all five pavilions of Fira de Barcelona's Gran Vía exhibition centre from November 4th through the 12th. While you're in Barcelona, visit the Port Vell On-Water Show, which will feature 231 large boats. Interested more in what's going on UNDER the sea? You're in luck, because the 45th Barcelona Boat Show will host the first ever BCN Dive, dedicated to the underwater world, during November 4-7. 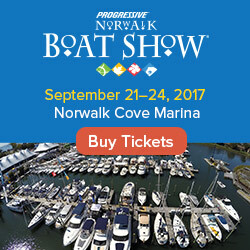 Before you go, visit the boat show site here. I scoured the web today and found the most unique boat for sale I have ever seen: A Coast Guard motor life boat. This 44' ship has a characteristic that you find from your run-of-the-mill Bayliner or Viking: She's a self righting ship. That means that if she is overturned, the vessel will return to an upright position in 30 seconds or less. This ship was designed to operate up to 50 miles offshore in 30 foot waves and 20 foot surf close into shore. They have room for 21 survivors below decks and have approximately a 250 nautical mile cruising range. This ship was also designed to tow up to 125 tons.